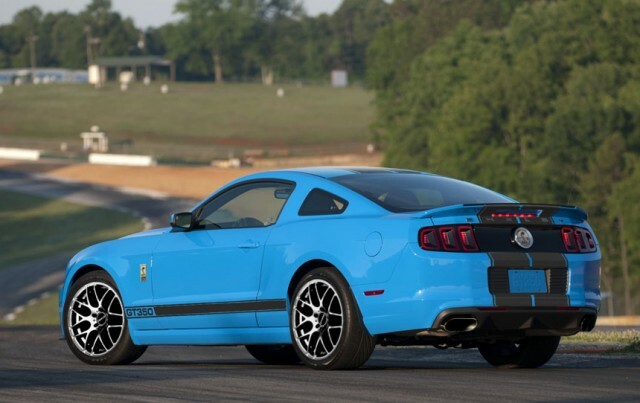 The New 2013 Shelby GT350 Puts Down 624 Horsepower! We have to give props to the first ever aftermarket production Mustang, the Shelby GT350. It seems to be lurking in the shadows of its sibling, the super high-performance GT500 that makes a mind blowing 662 horsepower straight out of the factory. It’s time that they brightened up this commemorative GT350 with a bigger color palette for ’13 model year! These cars were previously limited to only red, white, blue, or black (with gold) package. This time around the whole ‘Stang palette is available with the following color options: Grabber Blue, Sterling Gray Metallic, “Gotta Have it” Green, Candy Red Tint Coat Metallic, Ingot Silver Metallic, Deep Impact Blue Metallic, Race Red, Performance White, and Black with the option to choose between Satin Black or Gloss White Stripes. Let’s not forget Azure Blue Metallic on Performance White and Ingot Metallic with new wheels available in either Satint Black or Bright Silver Metallic. Let’s see what we’re working with in regards to performance. The GT350 has a base horsepower of 525 horses put down by a naturally aspirated V8. Another version rocks a Ford Racing supercharger and puts down an impressive 624 horses! Unlike its sibling, this Shelby is available with an optional auto transmission. Why would you want to do that when the manual comes with a stock short throw shifter? On top of all hat the new ’13 GT350 has a one piece drive shaft, bigger brakes, cooling enhancements, interior upgrades and a paint-matched billet aluminum engine cap set. A cold air package is available for the normal aspirated engine to bump up the power to 450 hp. Only 350 of these bad boys will be produced. So, Naturally-aspirated or supercharged? Gotta Have It Green or Deep Impact Blue? Tell us below! Previous Entry Watch AM & Bama on Velocity Channel Show: All Girls Garage! Next Entry VIDEO: Ready for the Largest East Coast Mustang Car Show? So the CAI bumps the horsepower up from 525 to 450??? I would go with a naturally aspirated version. Performance White with Gloss Black Stripes and a black roof. Or Impact Blue w/Gloss White Stripes and a black roof. Or Red Candy w/Gloss Black Stripes. Probably have to be one of these 3 on a hardtop as well. When you write put down, I automatically think of horse power at the wheels, which I don’t believe these numbers represent. “Puts down” ? I think she means “puts out”. They ment 550hp with the cai. LOL, this isn’t putting out 550HP NA. Its supposed to say 425HP without the CAI and 450HP with it. 624HP is the same output as the Ford Racing supercharger, part number M-6066-MGT624PD. This is the same 5.0 that comes in a GT. well an auto is good in las vegas since you never make a green light unless you run it constant clutch on floor gets old and leg gets tired. now if u lived where less lights especially red all the time stick is great. I would have to get a Gotta Have it Green with White Stripes, manual of course.